I have an awesome idea for …, where can I find an investor? This question comes back like a boomerang when I meet entrepreneurs, read posts in startup groups on Facebook or LinkedIn. Truth be told, you shouldn’t. 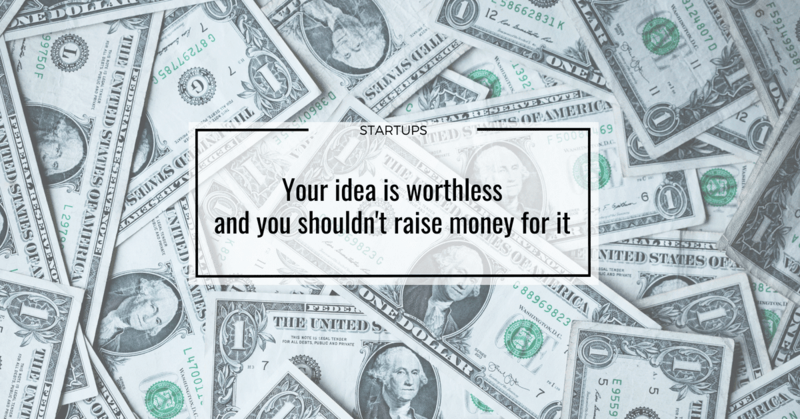 Before you even think about looking for capital, you need to understand how the startup funding, or in fact any funding, works. It’s a very simple deal at the core of it. The best way to understand how it works on the investor side… is to look how professional poker players approach the game. Poker is not about luck, it’s a numbers game. In order to win in the long term, you don’t focus on a single hand. You focus on building a strategy that gives you positive expected value. Which means that if you keep playing this strategy enough times to get to a statistical relevance, you will win. For sure. – says Łukasz Grabowski, high stakes online poker pro and coach in Smart Spin, the biggest poker school in the world. You calculate how much you can win. You make a decision to place a bet or pass. Investing in high-risk high-reward ventures (called startups) follows the same rule. The one question is: “Are my odds of winning higher or lower than what I have to invest vs what the expected income on the exit is?”. That means you need to present your venture in a way that the VC can estimate how much can they make and what are the odds for the success. When the idea is all you have, your odds of winning are completely unknown. You can’t even say that it’s 1:100. That’s why at this stage your possible investors are called family, friends, and fools. They invest in your gut feeling only. When you validate problem-solution fit, you can probably asses that your chance of winning is 1:100, 1:50 or 1:10. So how much do you have to increase your value to be fundable? Well if your odds of success are 1:50, you need to convince the VC that they can make more than 50x return on the investment. How much more? That depends on their strategy and this is something you should ask the investors. The more you know about your startup, the higher the odds of winning. That’s why with each round you get higher valuation which lets you raise more money for smaller equity stake and you’re expected to grow your value by a lower multiplicator. That clearly shows that VC money is 18x more expensive for you than a bank loan. So why raise at all? Because no bank will ever fund you if there’s only 1 chance in 10 that you will pay back the capital. The name “startup” used to be reserved for ventures that have high-risk high-reward characteristics and did not have access to traditional funding (revenue, own capital, bank loans). The best way to decide is to treat your startup as your own investment and ask yourself the very same question. Are my odds of winning high enough for me to risk 5 years of my life, my savings, health, and relations to bet on the possible gain? And this question is much harder. The VCs have a huge advantage – they can invest in dozens of startups and play the numbers game. You only have a few chances in your life, so you need to place your bets with care. Having that in mind, the only situation when it makes sense for you to raise is when you need the money to scale the things that work. Gather the knowledge you have, uncover the “flop” (build the right team, get to the problem-solution fit, get to the product-market fit). Then raise enough to either get to the Even Breaking Point or to close the next round and uncover the turn (your ability to scale in your TAM or find new markets to expand to) and river (your options for exit). Do not start making your app with an MVP! Why do you need innovation workshops?